Alfonso Fernando ,77, of Metro Manila, Philippines passed away August 17, 2001. Born on August 2, 1924 in Dumarao, Capiz, Philippines, he was predeceased by his mother (Rosario)and his father (Cornelio). He was a very loving father, a dedicated husband to Remedios (deceased September 6, 2014), an unselfish brother, and a very caring and doting grandfather. 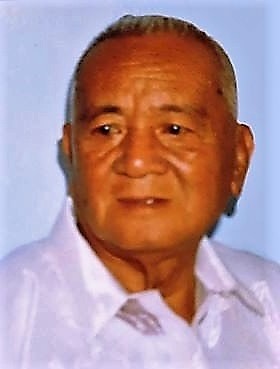 Alfonso is lovingly remembered by his seven daughters, Lilian (Francis – deceased), Lilibeth (Allan), Lorna (Rodolfo), Maria Lowina, Liberty (Dencio), Maria Luz (Carlo), and Mary Joy (Aldrich); ten grandchildren Allan Dominic, Markel, Mary Kitly, Benedict, Maria Carla Jemimah, Broderick, Dana Louise, Jose Andrew Carlos, Blaise, and Alexa. Having lost his father at very early age, Alfonso worked hard to overcome the challenges of poverty, strengthened by his great faith in God’s providential love. He journeyed to become a skilled boiler operator – served in South Korea with the Americans, worked at Meralco, and retired at Goodyear Tire and Rubber Company, Philippines. His legacy is lovingly remembered – a farm for his mother and five siblings, a house for his wife and children, his fatherly generosity to his wife and children, and university education for all his daughters. He was so dedicated in his work that he was featured in Goodyear Tire and Rubber Company’s newspaper as a model employee who had not taken any sick leave during his first decade with the Company. Alfonso was laid to rest at Evergreen Memorial Garden in Pasig City, Philippines, and is memorialized at Living Waters Columbarium, in St. Gianna Beretta Molla Church in Winnipeg.